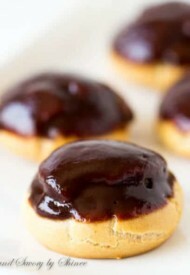 Simple cream puffs filled with light Nutella whipped cream and topped with glossy chocolate ganache. 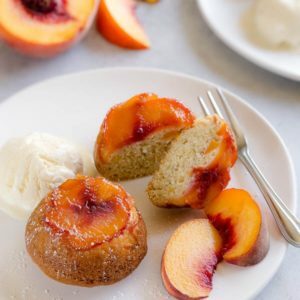 Light and flavorful dessert for all occasions! It seems like it’s been forever since I posted anything chocolate. Wait, never mind, it’s only been a couple of weeks. 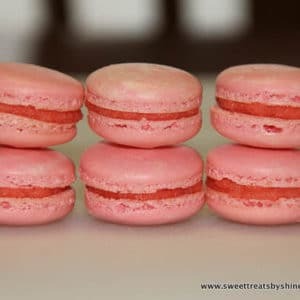 (Hi, hazelnut chocolate macarons!) 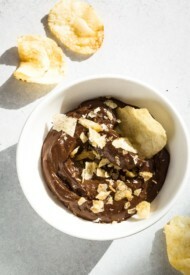 Nonetheless, it’s always a good time for chocolate recipe, right? Today, I have a simple, yet elegant and deliciously light pastry dessert for you. 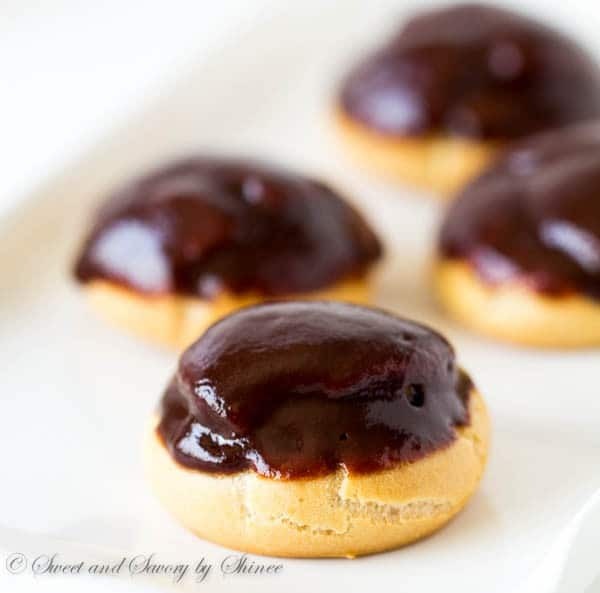 Say “Hi” to these dainty little Double Chocolate Profiteroles! 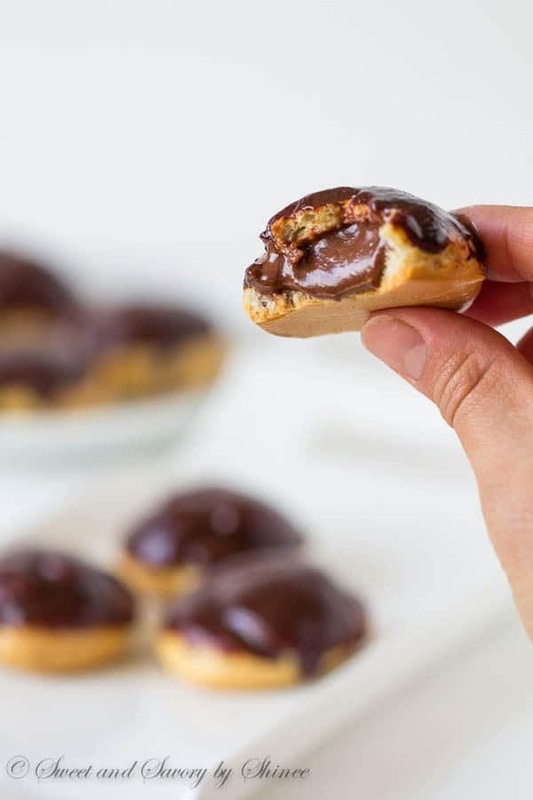 Don’t let the fancy name fool you, these are none other than simple cream puffs filled with light Nutella whipped cream and topped with glossy dark chocolate ganache. Light as feather, these little chocolate morsels are so addicting! Did I mention how simple it’s to make these? We’ll start with basic choux pastry (aka double cooked pastry). Just like my lemon crème puffs, I used water for a base of this batter, instead of mixture of milk and water. Why? I found that this particular dough rises much better with less amount of fat. It never fails to amaze me how these little puff pastries rise with perfect hollow center, waiting to be filled with delicious filling. This time, I mixed up whipped cream with Nutella for the filling. 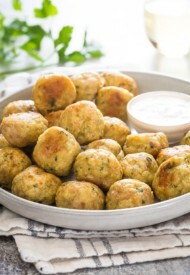 So easy, yet light (obviously, not calorie-wise) and delicous! And for the final touch, we’ll dip the filled cream puffs in a glossy dark chocolate ganache!! Heaven! If my lemon crème puffs didn’t quite convince you to whip up a batch, hope this chocolate version will do just that! Aren’t they just irresistible?? 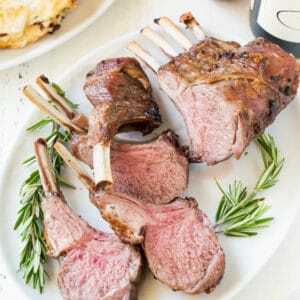 Now if you’ll excuse me, I’m gonna go and get a bite of this heaven right now! 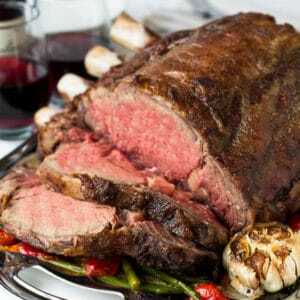 Preheat oven to 425°F (220°C). Line 2 baking sheets with parchment paper, or silicone mat. In a medium saucepan, combine 2/3 cup (150ml) of water, butter, sugar and salt and bring the mixture to a boil over medium high heat. Once the butter is melted and mixture is boiling, add the flour all at once, reduce the heat to medium. Using a wooden spoon, continuously stir the mixture. The dough will start to form into a ball. Keep mixing for another 3-4 minutes until light crust forms on the bottom of the pan. Transfer the dough into a mixing bowl with paddle attachment and mix it for a few minutes on low speed until the mixture is at room temperature. (Alternatively, you can use a wooden spoon. Mixer is not required here!) Add the eggs one at a time, beating well after each addition. This will help to get egg absorbed into the dough quicker. The dough should not be too runny, yet not too thick. Transfer the batter into a pastry bag and pipe into 1.5-inch rounds couple inches apart. Level peaked tops with wet fingertip, if needed. To make the filling, whip the heavy cream until hard peaks form in a mixing bowl with whisk attachment. Fold in Nutela and gently mix until smooth. Transfer the filling into a pastry bag with small round tip (I used Wilton #7 round tip). 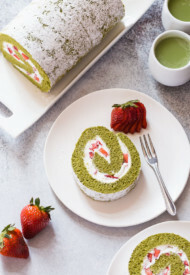 When ready to serve, pipe the filling into each pastry shell through a small hole on the side. (Mine usually have a small hole somewhere, but you can also make a small slit with a knife.) Alternatively, you can cut the pastry shells horizontally and fill the shells that way. 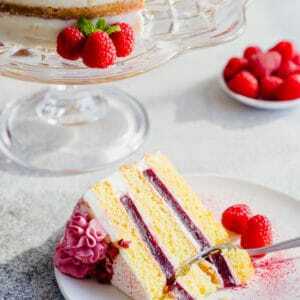 To make the glaze, microwave the cream for 30-60secons, or until hot. Place the chocolate chips in a small bowl and pour the hot cream over it. Let is sit for a minute and then mix until smooth. 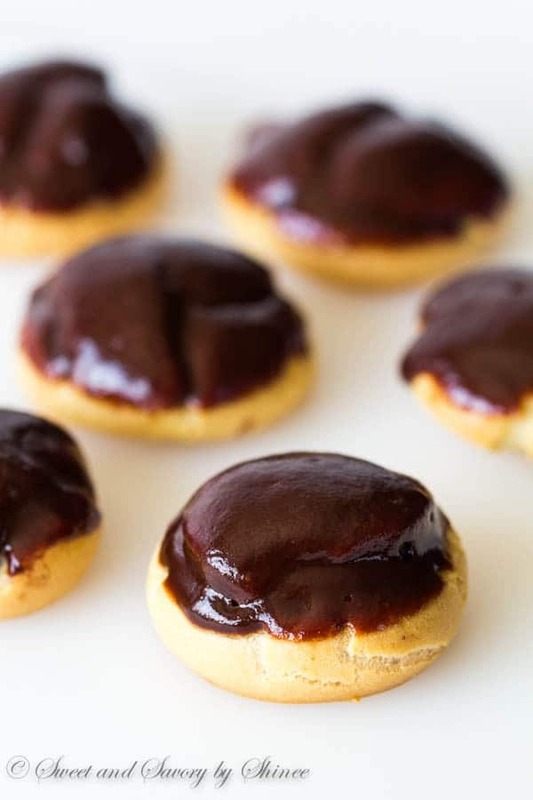 Dip the filled cream puffs into the chocolate ganache and arrange them on a platter. Serve immediately. Though it’s best to serve the filled cream puffs right away, you can store them in airtight container in the fridge for 1-2 days. To make ahead: bake the pastry shells up to a day in advance and store in airtight container at room temperature. I have been thinking about making cream puffs for a while – and now I know exactly what recipe to use. These look heavenly! Oh, these look so yummy! A chocolate lovers dream cookie. For sure! 🙂 Thanks, Theresa! Shinee, everything you make looks so yummy! I’ve had chocolate eclairs on my baking list for a few months, but you beat me to it. (Not that having more chocolate cream puff-goodness is ever a bad thing.) I want to dive into these.. YUM! Sharing. These look amazing! I keep saying I need to try making cream puffs, but I still haven’t done it. These are definitely worth the try! Agreed, Carlee. Thanks for visiting! Hi Shinee! How are you? 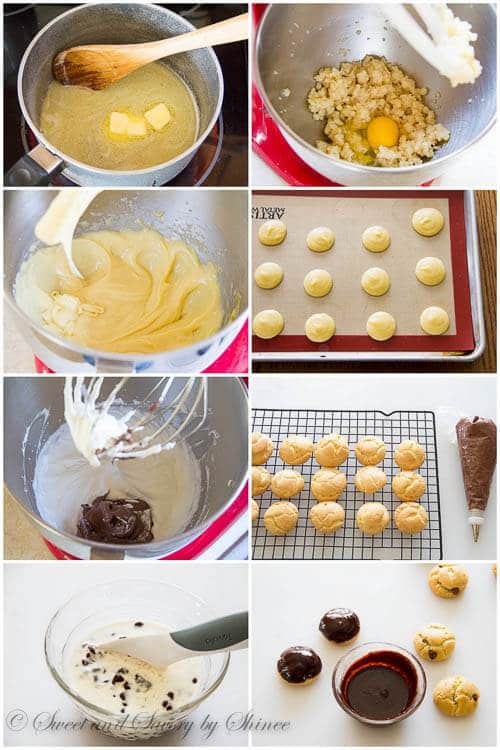 I love profiteroles and these look so good! Love the double chocolate. These look amazing, Shinee! I could go for one right now! Just one? 🙂 jk Thanks, Michelle! Gorgeous love!!! I love a good profiterole!!! Makes me think I am all French and fancy 🙂 Have a great weekend! Haha thanks, Mila! You have a great weekend as well! These guys look incredible, the photos show off that beautiful shiny ganache surface wonderfully. And Nutella whipped cream? DELICIOUS! Yeah, can’t get any better than that, right? 🙂 Love Nutella. Thanks, Nicole!